TACO TUESDAY! What better day of the week to share my new faaaav recipe?! Although this recipe was made a few weeks back (so behind on posting!) I’m wishing I had it riiiiight about now. Ever have one of those mentally exhausting days, where bedtime at 8pm sounds ideal? Welp, that’s me today and I am TIRED. Is it Friday yet?! I’ve wanted to come up with a guuud vegan fish taco recipe for a while now, but luckily, my friend from work inspired me to try one with Heart of Palms! She made a version of these battered and fried in the air fryer, which sadly I don’t own (or have the space for)- but to me, my all time favorite fish tacos were always baked and flaked to perfection. 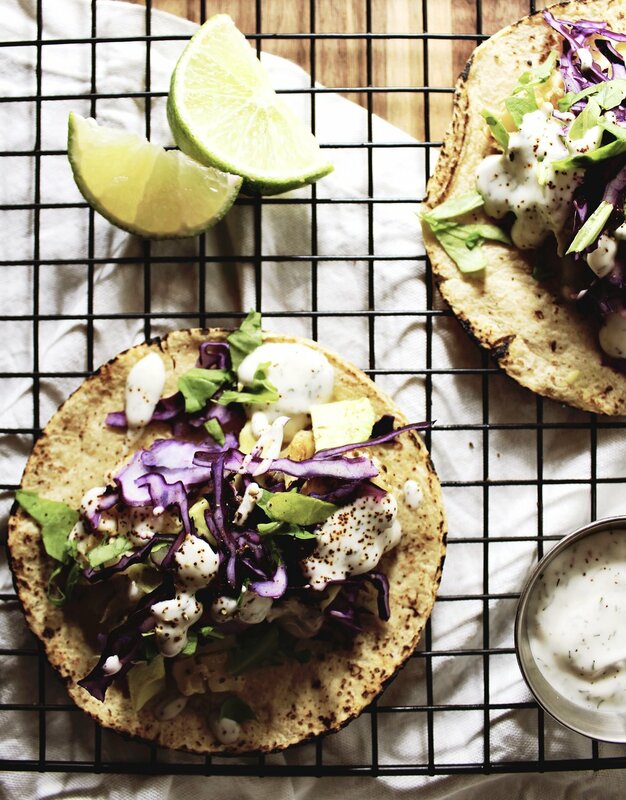 SO, I took all of my favorite seasonings from when I used to make Mahi Mahi fish tacos back in the day, and just added them to this great & healthy alternative. And voila! It was a success! Don’t get me wrong. I tried many, many times to get this right- and I have to say I feel like I really perfected it. Plus, your house wont smell like baked fish. WOohoo! “FISH”: Preheat your oven to 400 degrees fahrenheit. In a small bowl, break up/shred the heart of palms with a fork. Separately combine remaining ingredients, and pour over the palms. Toss to coat well. You can either cook it right away, or let marinade in the fridge longer for a deeper flavor! When ready to cook, spread out in a small baking pan, and pop in the oven. Cook for 15 mins, until lightly golden around the edges. Warm your tortillas, dice up veggies + assemble tacos to perfection! Combine all ingredients, and [generously] pour over zeeee tacos! Enjoy!